Cast: Michael Caine (Jack), Tom Courtenay (Vic), David Hemmings (Lenny), Bob Hoskins (Ray), Helen Mirren (Amy), Ray Winstone (Vince), J J Field (Young Jack), Cameron Fitch (Young Vic), Nolan Hemmings (Young Lenny), Anatol Yusef (Young Ray), Kelly Reilly (Young Amy), Stephen McCole (Young Vince), George Innes (Bernie). Crew: Fred Schepisi (director), Elisabeth Robinson (producer), Fred Schepisi (writer), Paul Grabowsky (music), Brian Tufano (cinematography), Kate Williams (editor), Tim Harvey (production designer). Graham Swift’s novel Last Orders was first published in 1996 and won the prestigious Booker Prize that year, arguably the highest honour in British fiction. Soon after film producer Elisabeth Robinson showed the book to Australian writer/director Fred Schepisi. The pair persuaded Swift to let them adapt it into a film. Schepisi began writing the screenplay with Swift providing critiques on each successive draft. The project got commitments from actors Caine, Tom Courtenay, Bob Hoskins and Ray Winstone, but it took another two years to raise sufficient finance to begin shooting. In his DVD commentary, Schepisi remembers offering the key part of Jack to Caine: ‘He said “Oh damn, okay. Yes, I’ve got to do this. I knew I’d be playing my father one day.”’ Caine found himself acting the role of a man dying of cancer at St Thomas’s Hospital – just as his own father had done. There was another strong resonance for the actor. In the film Jack’s wife Amy visits her retarded daughter at a care home once a week for 50 years. Caine’s own mother had given birth to an illegitimate son in the 1920s who suffered from epilepsy. At the time the illness was treated as a form of insanity and the boy spent half a century in an asylum, secretly visited by his mother every week. Caine only learned about his half-brother after their mother had died. ‘It was a very personal reason for him doing this film,’ Schepisi says in the commentary. The $12 million production was shot over nine weeks from October to December 2000, during the wettest autumn for nearly 250 years. (A pre-shoot had already taken place during summer in Kent for a sequence showing hop-picking.) Filming took place at locations around London and Kent, with studio work at Pinewood and in an unused warehouse in Peckham. Caine was only required for three weeks of the shoot, before flying to the South of France to join the cast of Quicksand (2002). Last Orders reunited him and old friend Bob Hoskins, with whom he had appeared in The Honorary Consul (1983), Sweet Liberty, Mona Lisa (both 1986) and Blue Ice (1992). The film received its world premiere at the Toronto Film Festival in September 2001, with a screening at the London Film Festival two months later. Last Orders opened in American cinemas during December 2001, rated R. Many critics gave it strong notices and the picture grossed nearly $2.5 million from a limited release. The cast won the US National Board of Review’s award for best ensemble performance. 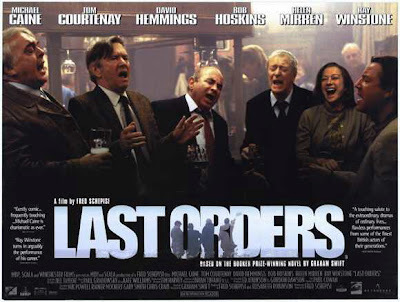 Last Orders was released to British cinemas in January 2002 with a 15 rating, gathering glowing reviews from critics and grossing $1.3 million. The film was a bigger hit in Australia, taking more than $1.7 million at the box office. Last Orders was issued on DVD and VHS in 2002. Verdict: If you want action, adventure and high octane thrills, go elsewhere. If you want a moving, funny and emotionally satisfying film about life, love and friendship, then Last Orders is the picture for you. Schepisi succeeds in adapting a heartfelt, literary novel into a small gem of a movie, his script and direction effortlessly guiding you through a complex interweaving of narratives and flashbacks. Paul Grabowsky contributes a haunting, jazz-tinged score that never overwhelms or overstates, just like the rest of this classy feature. The cast is uniformly excellent, with Caine in fine form as a man facing his own mortality. If you can watch this film without shedding a tear, you must have a heart of stone. Never crass or sentimental, Last Orders is emotionally draining and life affirming at the same time.